So, there’s this purple wall. It’s in London’s Peckham. I think there’s some building work going on, I dunno, I can’t see over it. It’s fairly unremarkable, save for its vivid purple colour. I thought it might look okay to stand in front of wearing some clothes. And having considered the full ramifications of this startling and controversial idea, I did exactly that. 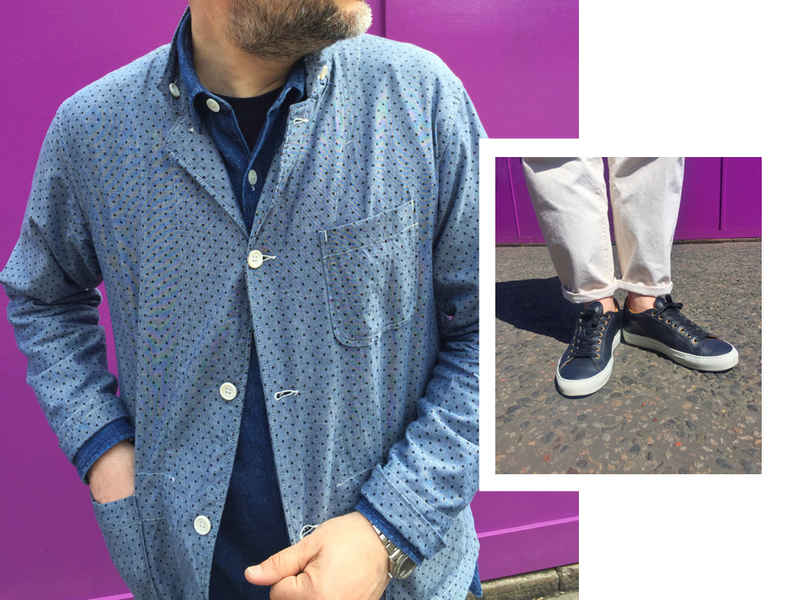 The apparatus at play here includes a chambray blazer with polka dots from Engineered Garments SS16. This style is called the Loiter – single breasted, unlined, work style cuffs and concealable throat tabs. Totally lightweight, eminently throw-on-able, for me, it’s become a regular go-to. Grab one at The Bureau. I’m also wearing a pair of Ordinary Fits five pocket jeans in ecru – I bought them in a large and they’re satisfyingly loose. 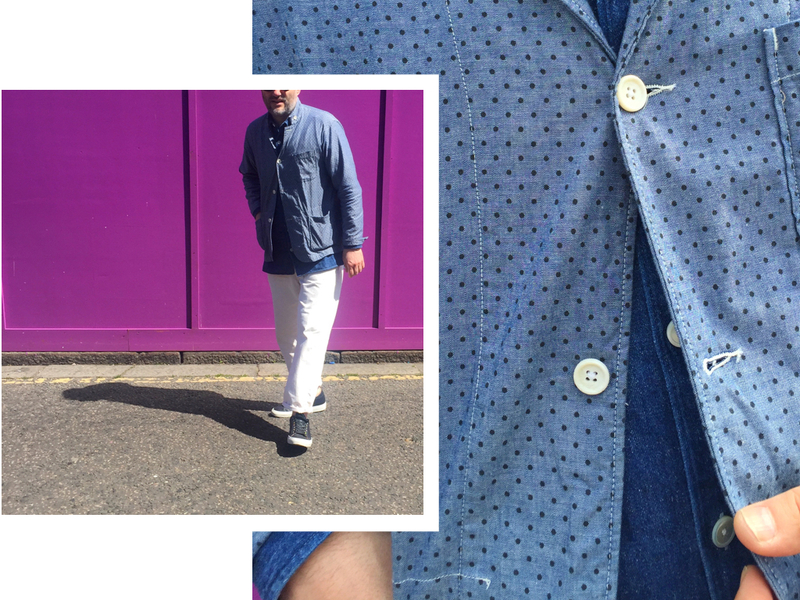 Tucked under that blazer there’s a long-line Our Legacy denim shirt from last season. I’ve had a lot of wear out of it and even with frequent washes, it’s still looking pretty sharp and dark. I’m also getting mad play from these Sandays sneakers. 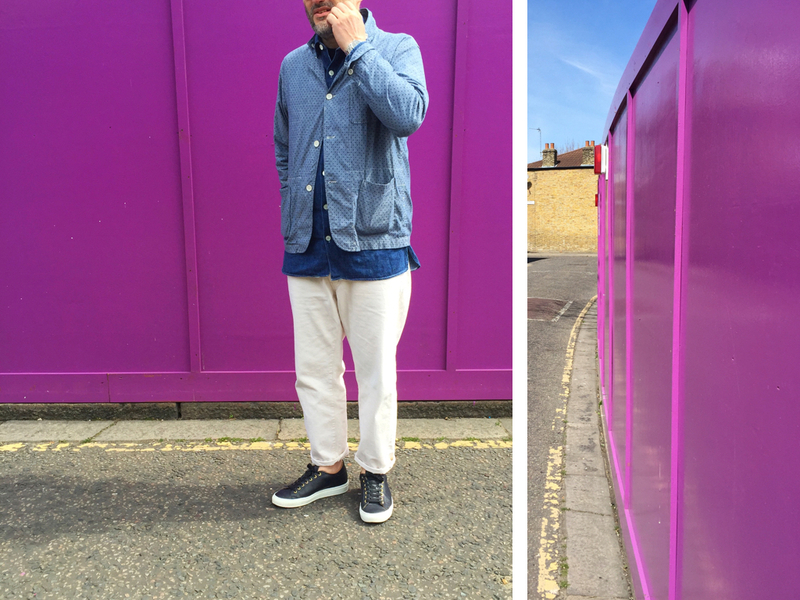 I’ve now got the same style in navy, white and what’s called ‘vegtan’, which is basically a sort of peach colour. They’re Italian, premium quality and most people seem to notice the brass eyelets, which certainly smarten them up. Best of all, while they look a little like Common Projects, any kind of stamped or stitched on branding is mercifully absent. And that, my friends, is what I choose to wear when standing in front of a purple wall.